Posts Tagged "Thank You Cards"
Home » Posts Tagged "Thank You Cards"
I just found these thank you cards from various people I worked with from 1978 to 1985. Memories. Top Left: The Perfecto! Gracias! card came with some earrings from Cartier in 1978. I had just produced a show for La Coupe in Barcelona, Spain, in front of over 2,0000 people and we were a huge success. Charles Booth was very happy. Top Right: This card came from John Sahag. For Christmas 1985. It wasn’t alas forever. But the sentiment was beautiful. And it came with a magnum bottle of Dom Pérignon. Bottom Left: This card came with a huge bouquet of flowers so not his signature. Vidal Sassoon had just seen my first Collection I had produced in 1979 – Soft Cubism. 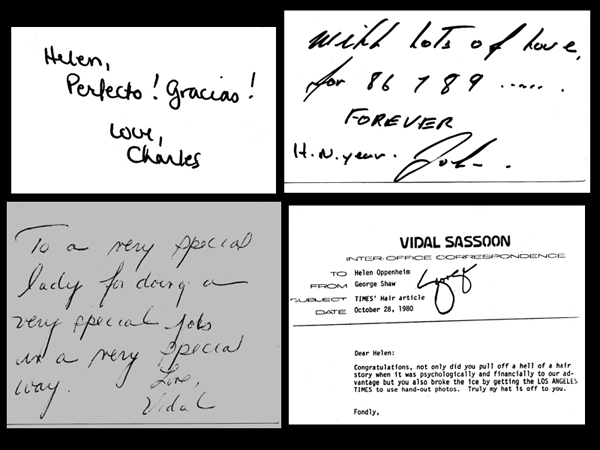 Bottom Right: Memo from George Shaw, publicist and philanthropist who worked to help promote everything Vidal Sassoon when I worked there as PR and Creative Director of the Vidal Sassoon Salons USA and Canada.